Global NCAP and AA South Africa has launched the project #SaferCarsforAfrica today in Cape Town, following the AA's recent release of the poor standards of entry cars report it conducted. The new campaign boasts the first independent crash test assessment of some of South Africa’s most popular compact and small cars. The crashworthiness results of the five cars tested show a wide range of safety performance, from four to zero stars for adult protection, with the lowest ratings resulting in a high probability of life threatening injury in a road crash. The models tested include South Africa’s best-selling car, the VW Polo Vivo as well as the Datsun Go+, Toyota Etios, Renault Sandero and Chery QQ3. This is a key segment to safety test as combined sales of these five cars account for around 65% of all the new cars sold in SA last year. Global NCAP chose the entry-level version of each model and as a result one of them was not fitted with airbags as standard. The results highlight differences in the structural integrity of the vehicles tested. Lauchlan McIntosh, Chairman of Global NCAP, said: “In 2016 the United Nations General Assembly adopted a road safety resolution which recognised the important role NCAPs play as a catalyst for improving vehicle safety standards. 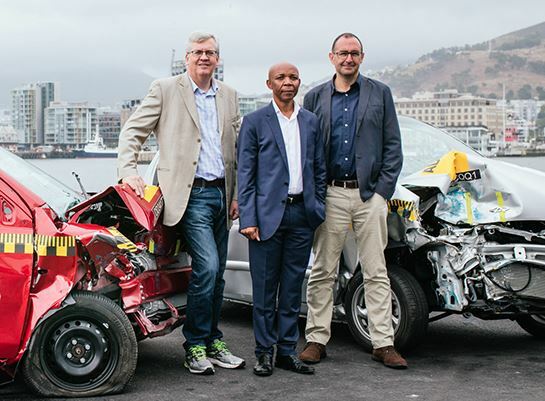 The UN has sought to encourage the spread of NCAPs across the regions and automotive markets of the World and today, in Cape Town, I am delighted that Global NCAP is helping to achieve that goal with the launch of the first ever crashworthiness programme for cars sold in Africa. Global NCAP has provided assistance to launch similar programmes in South America, India and the ASEAN region, programmes which have led to the delivery of safer cars into those markets over the last five years. CEO of the AA of South Africa, Collins Khumalo, commented: “The crash tests represent an important step in road safety in South Africa. We believe consumers have a right to know what the safety ratings are on the cars they want to buy. These results are critical to educating the public about vehicle safety, but, more than that, they empower road users to make informed decisions. In the same way emissions and green ratings are displayed on vehicles, we think safety ratings should also be displayed on vehicles, and we don’t believe this should be too much of a challenge to make happen.